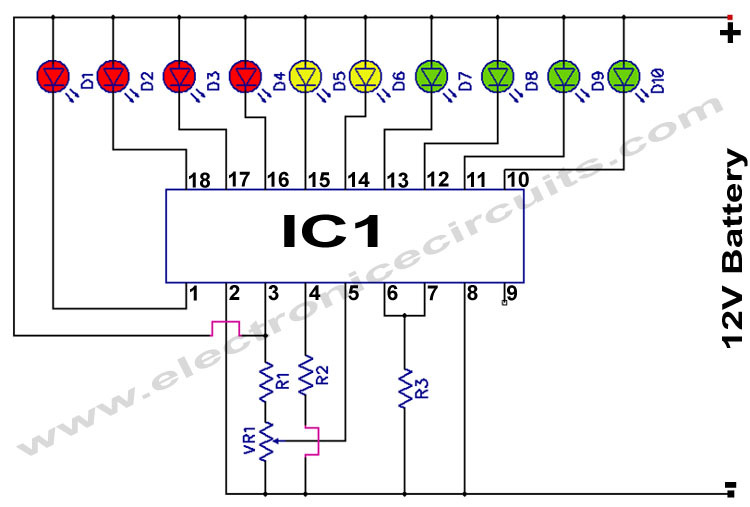 This bar graph LED battery level indicator circuit is based on LM3914 monolithic IC from National Semiconductor that senses the voltage levels of the battery and drives the 10 light emitting diodes based on the voltage level that is detected. To calibrate the circuit it must be connected to an adjustable regulated power supply. Connect an input voltage of 15 volt between the positive and negative poles and adjust the 10K preset until Led 10 lights up. Lower the voltage and in sequence all other Led’s will light up. Check that Led 1 lights up at approximately 10 volts. This circuit to your own needs by making small modifications. The circuits above is set for ‘DOT’ mode, meaning only one Led at a time will be lit. If you wish to use the ‘BAR’ mode, then connect pin 9 to the positive supply rail, but obviously with increased current consumption. 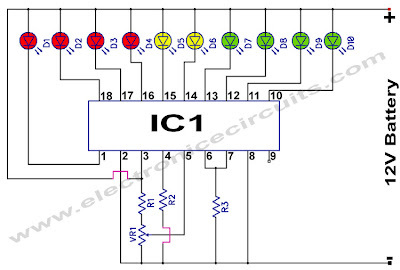 The LED brightness can be adjusted up- or down by choosing a different value for the 3K9 resistor connected at pin 6 and 7. You can also change the to monitoring voltage level. Remove the R2 resistor and connect 15volt to the input (+ and -) and adjust the 10K potentiometer until Led 10 lights up. Connect 200 Kilo-ohm potentiometer at pin 4 and -. Reconnect a voltage from 12 Volt to the input. Now adjust the 200K potentiometer until Led 1 lights up. When you are satisfied with the adjustment, feel free to exchange the 200K potentiometer with resistors again. (after measuring the resistance from the pot, obviously).